Are you bringing your best ideas to market? Not sure how your next marketing claim will perform? 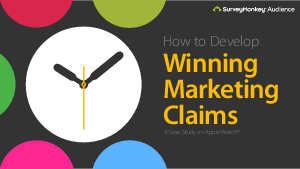 In this latest study, SurveyMonkey Audience tested two of Apple’s® marketing claims for its Apple Watch™ and came up with a clear winner. Get the Claims Testing guide to see the findings and learn how you can test your ideas with surveys. Download this free 21-page guide to learn which metrics to use to predict success.